MAJOR PRICE DROP TO INDUCE A SALE! 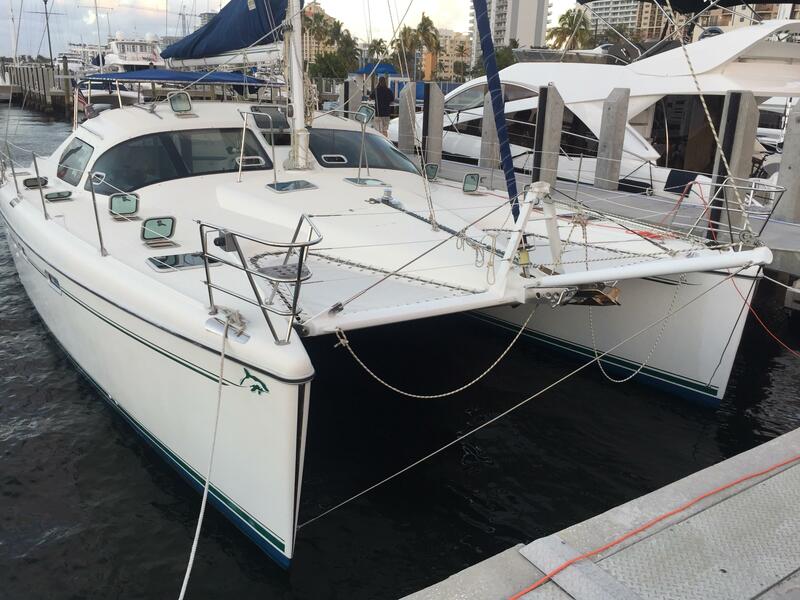 Four stateroom Two Head "Owner Layout"
If you are looking for a reasonably-priced, well-equipped and nicely-maintained "go anywhere" Sail Catamaran…this could be your boat ! OWNER WANTS IT SOLD NOW!! In the middle of a range spanning from 37 to 65 feet, the Privilege 435 includes a multitude of aesthetic, practical, and structural assets. 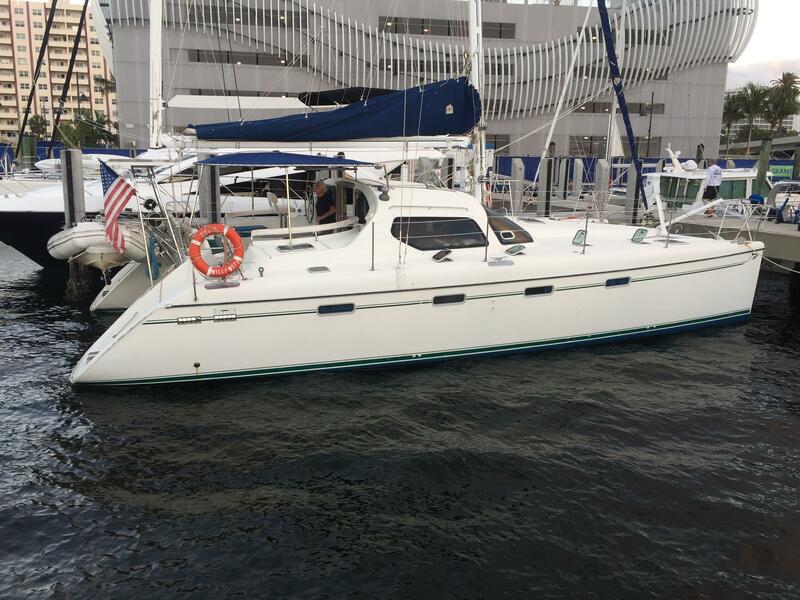 The boat's hulls offer unquestionable qualities of balance and power. The result of hi-tech manufacturing technology, the Privilege 435 successfully combines speed, comfort, and ergonomics. 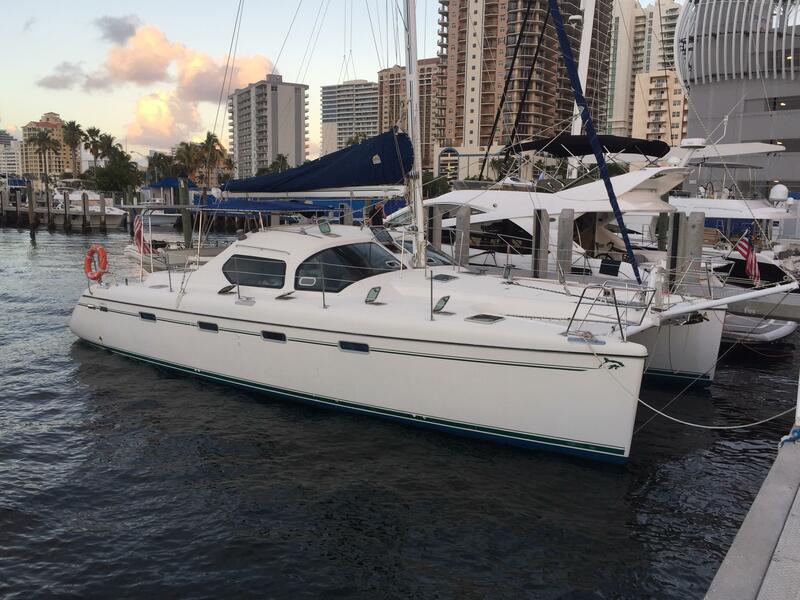 Her polyvalent size destines her not only for ocean voyaging but also for family cruises with multiple stopovers. Her qualities of comfort and ergonomics are indicated by her broad and deep transom steps, and by the ease with which one gains level access to the circular cockpit that is free of any sheets. 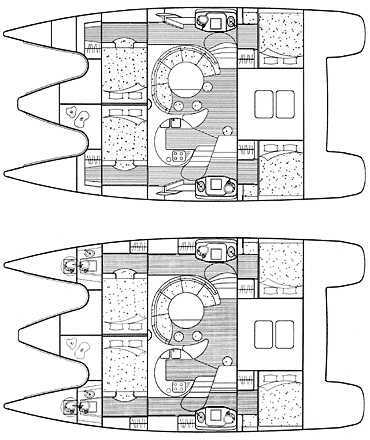 The sidedecks lead forward in complete safety, for access to the pod and the cabin and forward stowage lockers. Mast foot controls and the forepeak lockers are easily accessible and for a spell of relaxation, the trampolines can be enjoyed. Boasting a fleet of several hundred catamarans, accumulating thousands of miles under their keels, the Alliaura Marine Group shows the pragmatism and absolute care that has gone into the Privilege 435. 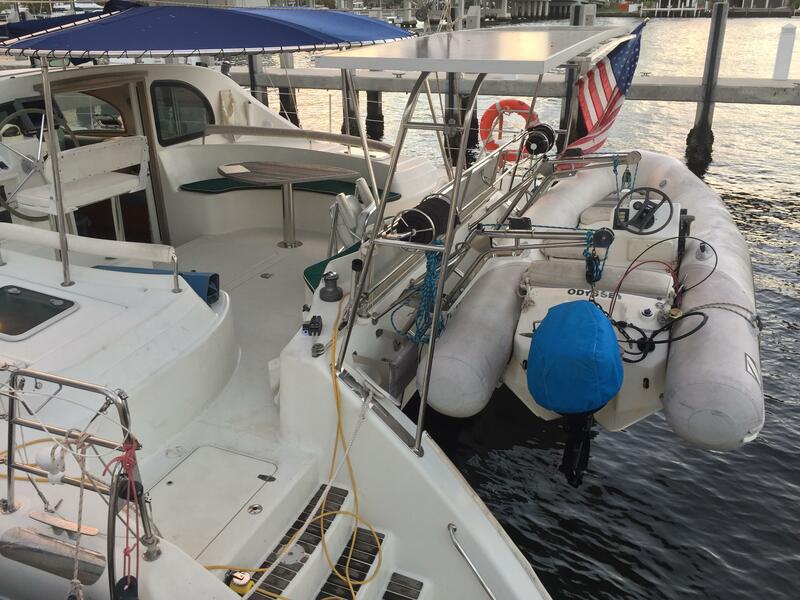 Through the saloon door to port, the chart table groups together on two superimposed levels, the electronics and the electrical panels supplying the boat's various 12V and 220V functions. The saloon is immediately accessible from the cockpit. It enables comfortable and practical watches to be kept thanks to the panoramic view and the seaberth cleverly integrated into the saloon settee. For relaxation, meals, and cooking, the Privilege 435 provides comfort and pleasure thanks to the luminosity and visibility from the saloon and galley. 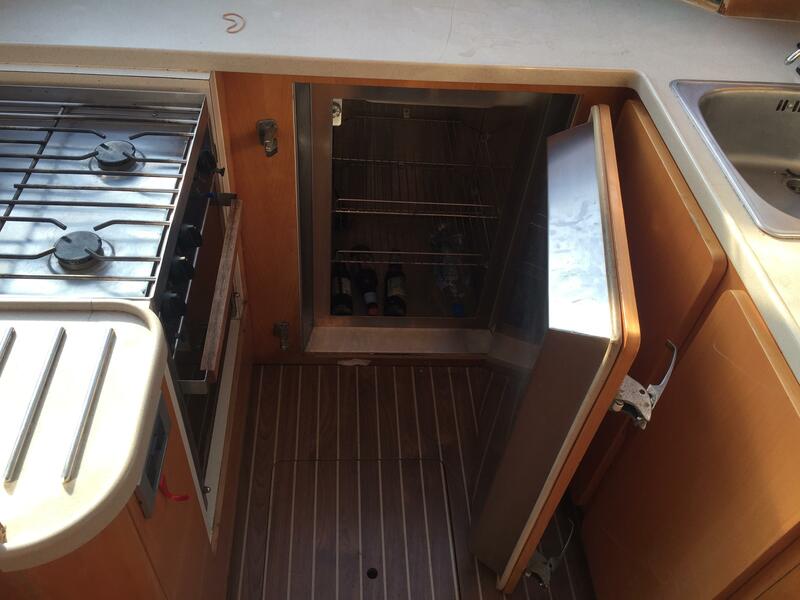 Functional and ergonomic, the split-level duplex galley has been purposefully offset from the saloon by a step down, and is equipped with work surfaces, domestic appliances, and stowage. The cabins have two separate 160 x 200 cm beds. 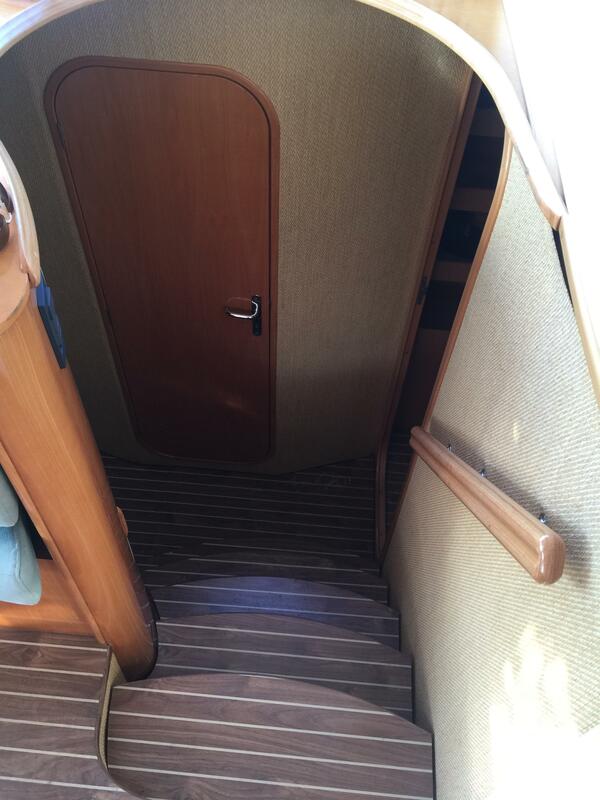 A sofa at the foot of the berths makes for easy dressing. 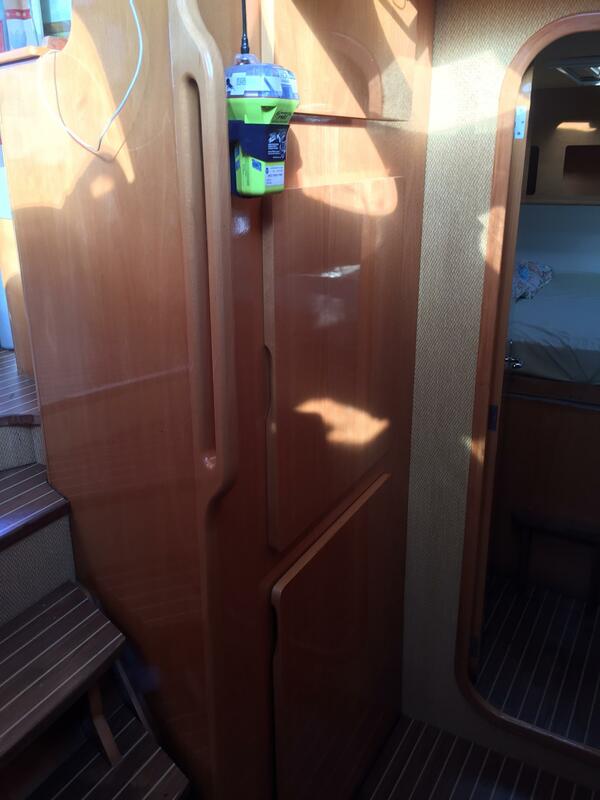 At the head of the berth, there is a shelf for bedtime books, and along the side, low cabinets accommodate personal effects. Directly accessible from the forward cabins, a veritable dressing room occupies part of the forepeak. 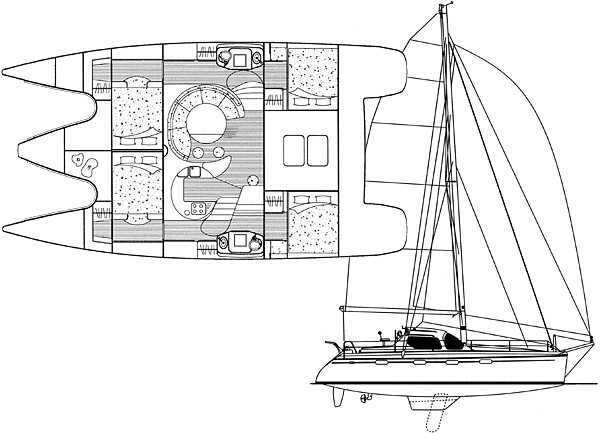 Both to port and to starboard, the aft cabins have generous living space. They are provided with a hanging locker, sofa, row of shelves, and end of cabin alcoves, without encroaching on the 160 x 200 cm berth identical to those in the forward cabins. In each hull, a head, independent from the rest of the boat, is fully equipped with all comforts including shower, washbasin, toilet, and locker. Thanks to the many deck hatches and portlights, airing is optimized by a system of dynamic forced ventilation. Finally, unanimously recognized by owners and professionals, the workmanship applied to the interiors remarkably illustrates the attention to detail, the luminosity and the warmth of the species of wood and the quality of the varnish work. An extremely qualified workforce, combined with the components, and the scrupulous selection of equipment suppliers, are the assets and guarantees with which The Privilege 345 is produced. The quality of the resins, cloths, foam sandwich cores and processes, has been approved by the best international certification organizations: Lloyd's, the Norwegian society Der Nordsk, and Bureau Veritas. The latter will deliver on demand a "Construction Monitoring Certificate". 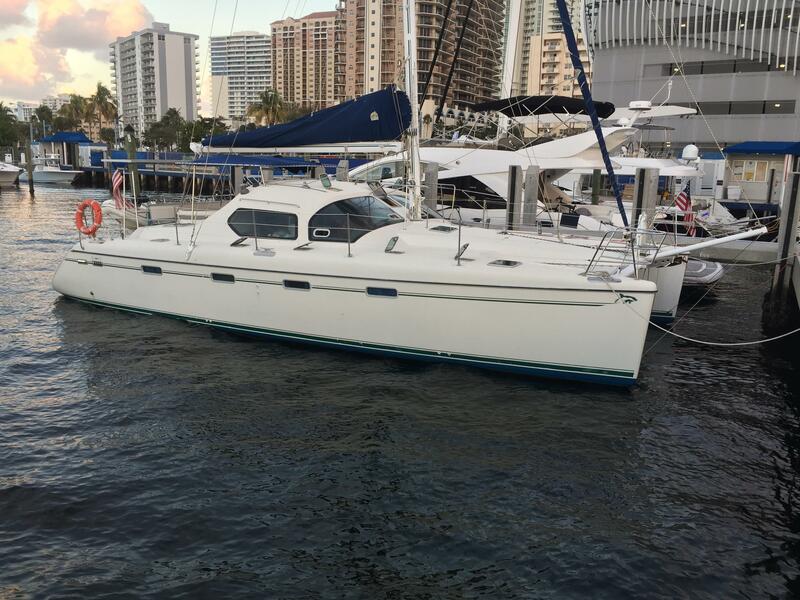 The Privilege 435 has all the attributes of performance: a sail - area displacement ratio optimized to offer comfort and performance while cruising, with more than 13 sq. meters - ton upwind and up to 26 sq. meters - ton off the wind. 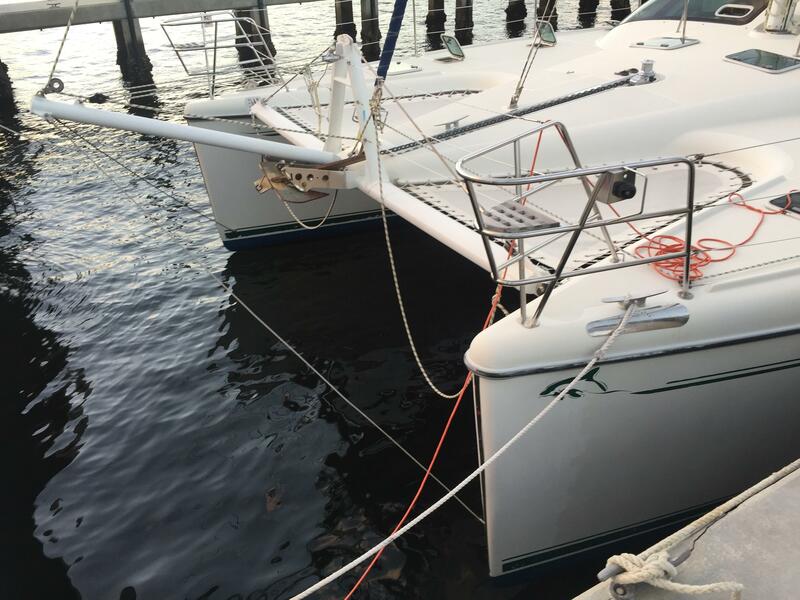 Depending on the owner's program, there is a choice between fixed fin keels or daggerboards, and appropriate hull lengths. A "Performance" version will satisfy the amateurs of strong sensations: it features a carbon fiber mast, daggerboards, Spectra sails, Max-Prop propellers, and stretched hulls. 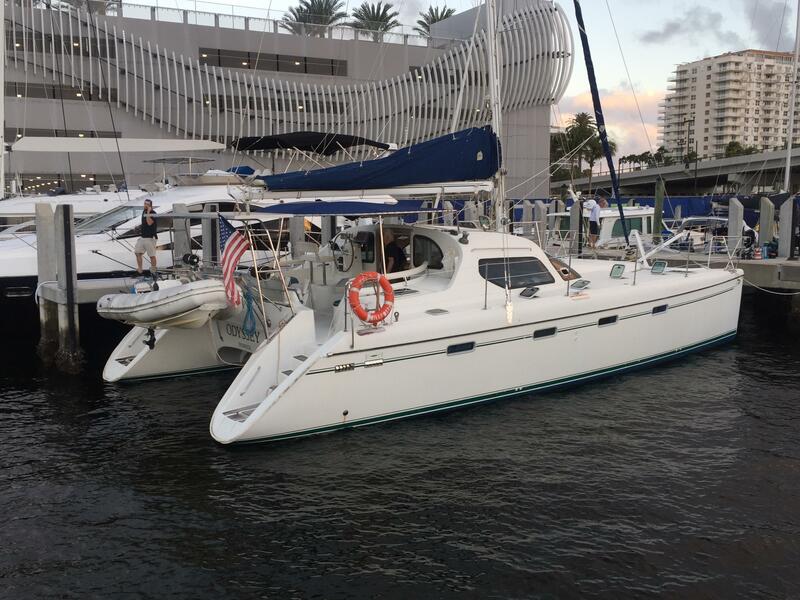 For the comfort of shorthanded crews, an "Easy Cruise " version provides a particularly complete answer: it features an in-boom furling mainsail, generator set, water maker, stretched hulls, fixed Bimini top, and 4 heads. With an 8-9 fractional rig, the Privilege 435 has a deck-stepped single spreader mast, balanced with cap shrouds and shrouds, forestay and baby stay. So, whatever the state of the wind and the sea, nothing is easier than adapting the sail area to the demands of the weather, and keeping the loads exerted on the mast in perfect balance. The safety of the Privilege 435 can also be demonstrated by its aptitude to maneuver and get out of delicate situations with her engines. Sail Drive power trains of 2 x 27 hp or 2 x 40 hp are available. Access to the engine compartments is either via a hatch in the cockpit, or from the aft cabins. These compartments can also house the generator set and the water maker. Large hatches located above the engines allow, if necessary, their rapid removal without risk of damage to the interior fittings. 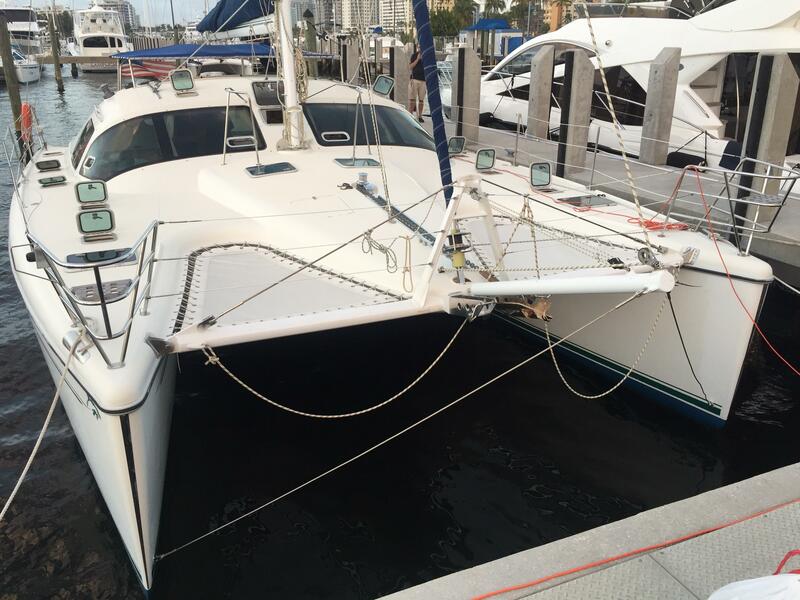 Hulls are constructed of Divinycell foam core and multidirectional glass fibers utilizing the vacuum bagging process. Kevlar reinforced keels. High stress areas are solid fiberglass. There are six watertight compartments with a watertight collission compartment with each crash bullkhead making this yacht virtually unsinkable.